I must’ve seen this one before, certainly when it first aired, but I’d forgotten it completely. Falls into the category of ‘trashy fun’ for me, along with Murder In Malibu. Yeah, i KNOW they’re not great Columbos, but they did make me smile. Giggle, even! Barry Corbin the Rich Texan stole the show, totally. The slo-mo lampshading of points and the Barney’s Recap scene felt like studio interference – the Columbo production team’s never condescended to its audience like this that I can recall. I want several of Sheri Danese’s wardrobe pieces and accessories for my own closet. “The slo-mo lampshading of points and the Barney’s Recap scene felt like studio interference” — I agree completely. I don’t remember any other episode that did so much to insult the audience’s intelligence. What really frustrated me about this episode was how uneven it was. The performances were good, especially Corbin’s; the basic plot was good; and how Columbo played the murderers against each other was great. I would watch it again for those reasons, but I’ll definitely take Jon’s advice about when to turn it off. We never learn how they meet, actually, and that’s a good point to bring up — there’s usually some sort of crossover between the lives of the lover and the husband, usually through the wife. We can really only guess — what party is a Forensics cop gonna get invited to where a loudmouth cowboy investor is gonna be at? I agree that this episode confirms that Columbo had a glass eye — but only as of the time of the episode, 1997. It’s not clear that Columbo had that condition for the entire run of the series. When Columbo made his first TV appearance in 1968, there was no federal law against disability discrimination, and I don’t believe it was against California law, either. So if Columbo could see out of only one eye, it’s possible he never would’ve been hired by the LAPD. By the way, one weakness of the 1990s Columbo episodes is that basically assume Columbo started with the LAPD in 1968. 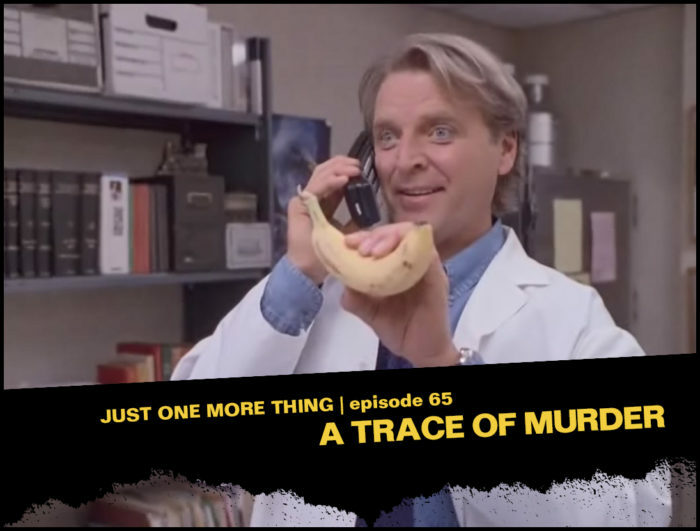 But “Prescription for Murder” makes clear Columbo was no rookie cop. He already was a Lieutenant, so obviously he’d been with the LAPD for several years. He also did not appear to be a newlywed, yet 1990s episodes suggested he was married in or about 1968, too. One other weird thing about the 1990s episodes is that “Dog” supposedly has not aged since the 1970s. It’s as if he’s one of the “Simpsons” characters, who never age except for episodes about the future. In fact, sometimes the 1990s episodes convey the impression that Columbo hasn’t aged, either, but has been frozen in time since the 1970s. On a personal note, I worked at a law firm in Universal City for 17 years, from 1992-2009, in an office building now owned by Comcast NBC Universal, but previously owned by Texaco and built in the 1980s for Getty Oil. Some of my work colleagues saw Peter Falk driving his Peugot around Universal City. The view out of the office I had for several years was basically identical to one of the scenes early in the 1973 episode “The Most Dangerous Match”; it shows the old Ventura Blvd. bridge crossing the 101 Freeway. So I always get deja vu when I see that shot. My building hadn’t been built as of 1973, so the shot probably was taken from the Sheraton Universal, where exterior scenes from this episode also were shot. Just got into the podcast a short time ago and glad I got “caught up” so I can comment in a timely manner. I love your podcast: RJ and Jon have good observations and point out new things that I never noticed about Columbo. I like it that you have different guests from various fields who are usually Columbo fans themselves. This is one of the few I had never seen before. I agree with most of the commentators that Barry Corbin and David Rasche gave good performances. (Although Sledgehammer has made me chuckle every time I see Rasche in a role, sort of like looking back at Leslie Nielsen.) The writing was awful, especially Columbo’s “soliloquy” about how he knows they had a relationship and the wrap up scene at Barney’s Beanery. Insulting to the intelligence of the viewers. Keep up the great work and I look forward to listening to the few episodes you have left. Yes, this one was a mixed bag. I could hear the fatigue in your voices. Bless you all. I agree, skip the recap and call it a day. One thing I found difficult about this episode was trying to determine when Columbo knew who did it. And you think it is earlier in the episode, but then Columbo shows that he truly did not know earlier when he sees Patrick push the sweetener across the table. A frustrating episode, when you know it had the ingredients & potential to be much better. As 90’s ones go, it’s a pretty good one. Idon’t have an issue with the recap at the end – in the formula, Columbo has to unveil the moments at some points, so why not? Columbo actually says ‘Murder House’ in this one, which brought back memories of RJ’s epic intro to your Columbo Goes To College episode. I reckon he suspects at the time when he’s inviting the alt. theories in the abandoned lab, about a hour in, but first cottons on to something in the lawyers office. He suspects Pat as he’s shooting down his theories. Also, your man McEevity has a walk on part in this one. I remember watching this episode instead of the Seinfeld season finale with Raquel Welch when it was originally broadcast and of the ’90s Columbo episodes, even though there are episodes I like more, this is probably the one I’ve rewatched the most, or at least the one that if it happens to be on, I’ll just sit and watch. I enjoy the plot, some of the lines (especially Barry Corbin’s and the checkout clerk’s) legitimately crack me up. While on the one hand, I feel like the time spent recapping the clues at the end could have been better spent, the payoff with Columbo hating the taste of the cigar with the cigar-clipper almost makes it worth it. For some reason, I sometimes forget this episode was originally before CSI debuted. How was there never a sitcom with David Rasche and David Leisure? It seems like a natural.